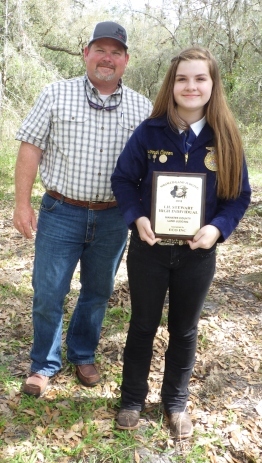 At the end of each school year, the Manatee River Soil and Water Conservation District (MRSWCD) sponsors a Conservation Award for one student from each FFA or 4-H chapter who participated in one of the board’s events. The teacher provides the conservation district with the name of the deserving student, a member of the board then presents an award plaque to the student at the year end banquet. Additionally, the board makes a monetary donation to the participating FFA chapter or 4-H.
Students who are selected for the award may have won the conservation oriented speech contest. Or they may have been the high scoring member of their land judging team at the local or state level, for example. Vice-Chair: John J. O’Connor, Jr. Supervisor: Callon C. ‘Buddy’ Keen, Jr. 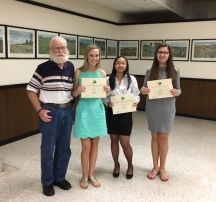 Speech Contest– The speech competition in November is held for Manatee County middle and high school students as part of Farm City Week. The competition is designed to develop leadership through participation in public speaking activities and to stimulate interest in conserving our natural resources. 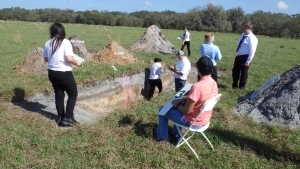 The topic is selected by the Association of Florida Conservation Districts. https://afcd.us/The winner qualifies for an area contest and the winner of the area contest is eligible to compete at the state contest. 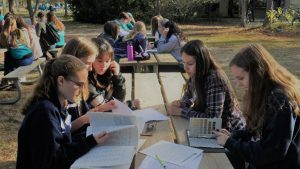 Congratulations to the following students who won the Conservation Award in 2018!